Every child got to choose a piece and painted it to the best of their ability. Take home treats for today were simple things -- glow necklaces (even for the boys) and the ball in the maze puzzle games. Next week everyone will come back to pick up their painted pieces. I keep telling myself that I'll come back another day with the now-9-year old and do some painting of pottery, myself. The cake was an Ice cream/ cake from Baskin-Robbins and was delish! As far as I can tell I remembered to bring most everything, except candles -- so we did without candles. Now there are two girls in our living room watching the Hannah Montana concert video (okay, it's a DVD. I don't think we'll ever stop calling them videos.) Supposedly having a sleep-over, although I'm not sure how much sleeping will go on. I hope your Thanksgiving was stress-free. Me? I have to make more pumpkin pies -- we are out and the family is clamoring for more. Hmmm, I seem to be giving you a blow by blow account of the process I'm going through with this story. all by Kate Waters, published by Scholastic Press. While I was talking about life way back then, the kids were passing around a square sided quart jar partially filled with heavy whipping cream, each taking turns shaking it. (I had promised them that they would make butter.) I also insisted that the adults help with the shaking, so that it would turn faster. Eventually, I read them my new Gather 'Round the Table story. I learned a lot doing this. As I read the story at the evening program, I discovered other words that needed to be replaced, phrases that needed to be changed. After 45 minutes we had heavy whipped cream filling the jar and the whole jar looked sorta yellow. While I opened the jar and removed some of the whipped cream to make space for more shaking, I instructed the kids about the craft they would work on while the parents finished shaking the butter jar. Suddenly -- the whipped cream in the jar turned to butter! (surprising the heck out of the man shaking the jar at the time.) I showed everyone the huge chunk of butter in the jar/ we talked about the liquid now being called buttermilk/ and then I poured off the buttermilk and removed the butter from the jar. After I pressed more liquid out of the butter, we ate. That morning I had made biscuits and corn pone for everyone. (Did you know that corn pone is actually a sort-of corn meal pancake which tastes like cornbread?) There was enough for everyone to have double helpings with butter on it. About half the kids were brave enough to try a small amount of buttermilk. A yummy time was had by all. And on Wednesday morning (today) I made those changes/ improvements in the manuscript that I had discovered on Tuesday. Someone asked about a word I used in yesterday's post. Is this an 'official' writing term? I have NO idea. But it's a word I use a lot when I'm not sure what I'm going to write. When I noodle my way into a story, I sit down at the computer, open a word processing document, and begin writing. But what I'm writing is not the story I'll end up with. I'm writing conversations with myself. (part of which I actually transferred to yesterday's blog entry. I began with the words Kill the Turkeys. Mentioned where the idea came from. (remember Sarah's video?) Why I wanted to write this. La-de-dah-de-dah. Why I was disturbed with 'save the turkeys' stories. Which led to what does happen on Thanksgiving? We're thankful for the harvest, which includes the beasts we kill to eat. What do we eat? What's served for Thanksgiving dinner? Who comes to this dinner -- relatives. Changed it to "Gather 'round the table"
and I was off and running with what became the picture book manuscript. All the above was the noodling I did as I worked my way into the story. Then I began thinking about Sara Palin going to an Alaskan turkey slaughterhouse to "pardon" one turkey -- as, right behind her on this video, other turkeys are killed to become Thanksgiving Turkeys. And how horrified people were to see this happening in the background of her Photo Opp. On the other hand, one person made a comment that I fully agree with -- Where do you think Thanksgiving Turkeys come from? Which kicked off thoughts about writing a story about killing turkeys. My husband told me that I probably wouldn't be able to sell "Kill the Turkeys" as a picture book. What I ended up with this afternoon, was a family holiday dinner which could be any in-gathering of family. I call it, Gather ‘Round the Table, but it’s actually kind of an Un-Gathering story. Just for fun, most of the names are family names. Now to figure out what the other two picture book manuscripts for the December Packet will be. It's snowing in Maryland. A week before Thanksgiving. This is the earliest I remember snow happening here. Whatever happened to global warming? Not only is it snowing, but it's sticking to the tree leaves and on the grass. The Weather service predicts a wetter than normal winter. Combined with cold means that middle states like Maryland could be in for a series of ice storms. Oh goodie. My least favorite weather. At least this year I'm working at a library near a major highway. When we had ice storms in the 1990s, I was working at a country library and was terrified driving those winding roads curving down to the two rivers I had to cross and then back up the hills, again. I drove through snow showers as I was returning home after having given a program at one of the Enoch Pratt Free Library branches about my adventures while researching the various books I wrote. (I was shot at when on an Air Force Base. I raced through a bad section of a town, taking pictures of buildings. I stood for hours taking pictures in 20 degree F. weather. (that's below freezing for those of you who only know Celcius ) And I was stalked at the Jefferson Memorial -- by a photographer for a cable program. As I arranged the transparencies spread out all over my bed preparing for this program, I kept mumbling to myself that pretty soon I was gonna need to put all this stuff on powerpoint. Which means buying the software, the projector, and taking the time to learn the program and putting it together. I always give them Anastasia Suen's Blog Central e-address. She has gathered together so many writers, artists, editors, agents, book reviewer's, and publisher's blogs that you'll not be able to read them all. I've found another gathering of good blogs, too. 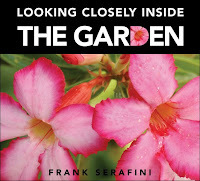 Looking Closely Inside the Garden, text and photographs by Frank Serafini. Kids Can Press, 2008. "Look very closely. What do you see? These questions face a black page with a four-inch circle in the center. The circle shows a small portion of the picture on the next page. I had wondered just why the publisher had not simply cut a hole in the black page to show the next page. Then I noticed that the close-up portion in the four-inch circle does not come directly under the circle on the next page. The author/ photographer has made the decision that the most interesting close-up might be in the far corner of the actual photograph. Opposite the large photograph (which bleeds onto the left hand page) is information about what you are seeing. This could be used as a test of observation/ a guessing game/ lessons about who and what are in a garden. Appropriate for a wide range of ages. Others in this series include: Looking Closely Across the Desert, Looking Closely Along the Shore, Looking Closely through the Forest, All Available now. More Nonfiction Monday messages can be found here. I bet the rest of you have your own stories. My husband got up early and was in line before the polls opened. He says there were some people who had already been there a while -- and who had brought lawn chairs to rest in while waiting. He was in and out in 15 minutes. But when he left the polling place, the line had grown to about 200 people and cars were parked all up and down the streets for blocks. I voted mid-morning, during the lull between the opening crush and the lunch crowd. It also took less than 15 minutes for me. But it took me much longer to get back to my car because of just generally chatting with people going in and out. Our local Brownie Girl Scout troops sold cookies at the polls all day long -- even during the rainstorm in the afternoon. Now, that's dedication. Almost everyone at work wore Red, White, and Blue on Tuesday. Actually, there was some discussion as to whether the flowers on my sweater were red -- or pink. Oh well. I tried. Wednesday, I put up a display of books about Obama, which were quickly checked out. I'm going to have to get rid of that 2006 biography of him, because the information in it probably was collected in 04 or 05. And I'm sure that tons of new volumes about him will be showing up on our shelves, soon. All those publishers who do one volume per president probably had contracted with writers some time ago to have books already written except for the last chapter. Now it'll be a race to get them published. I don't envy those writers. It's no fun to write about a person still alive and actively famous. Your research is never done. There's always a new event you would like to include before going to press. Today my day has been just like your day -- busy, busy. Monthly reports due. Replacement orders. Removing signs of Halloween in the library branch and storing it. Putting up the Thanksgiving book display. Notifying the winner of the Count the Candy Corn contest. And, on top of it all, kids are out of school -- and in the library. Why are the kids out of school? Monster machines have taken over their school buildings. By now they should be all set up and waiting. Waiting for people to come tomorrow. (Tuesday, November 4th) Hundreds of people. Thousands of people. Millions and billions and trillions of people. Anywho -- Are you going to be among them? Are you going to go VOTE? For more blog messages about the importance of voting, click this link. I vote because I CAN. My grandmother marched with the suffragists. My mother taught school and believed that God was a woman. And I vote in every election. I better not hear that my daughters have not voted, because too many people in our own family fought so that they could have the right to vote. You have that right, too. Go Vote, on Election day. Nic Bishop Spiders, written and illustrated by Nic Bishop (Scholastic Nonfiction, an imprint of Scholastic), 2007. 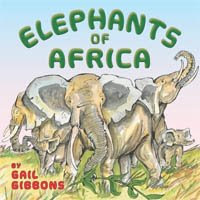 ALA Sibert Informational Book Medal honor. Mentioned in the previous post. I've gotta tell you, even tho I couldn't bear to look at the slides he showed about his spiders, I was enthralled hearing the background story of his adventures photographing spiders. This cover spider is a dancing spider -- but he only shows off to female spiders. So Nic had to also have female spiders on hand during his photo shoot. More links to Nonfiction Monday messages are here. Who is going to change the program announcements on the library's outdoor sign? Not me. Not during Spider months. Luckily I'm on a team and others 'volunteer' to do it, then. Periodically, my writing income pays for housecleaning. The nicest thing the cleaning ladies can say to me is to total up the number of spiders (and spider eggs) they have removed. My heros! A spider-free house for a few days! So, I'm in the bathroom, feeling great after they leave because there are no spiders around -- and what do I see? Oooh, that gives me chills. Anywho -- do NOT expect to see any reviews of spider books on this blog. And there will not be a picture attached to this message folks. There is no way I'm going to search through spider pictures to find the perfect one for my blog. No way. I even have problems weeding out the old spider books from my library's collection -- and don't you dare show me those new spider titles that have come in. Did you know that a SPIDER book won a Sibert Informational Book Medal honor at ALA? Nic Bishop Spiders, written and illustrated by Nic Bishop (Scholastic Nonfiction, an imprint of Scholastic) I had to sit at that award ceremony while he showed slides of his favorites. Yes, it's interesting that the cover picture is actually of a teeny tiny spider and he's quite beautiful -- but did you have to reproduce him so large? Too busy to blog -- that's me. In fact, it's been so long that Blogger has forgotten me and I had to go through that whole sign-in routine, again, just to get here. This week I'm trying to digest the things my Vermont College advisor told me about my packet of stories, and essay, and bibliography of picture books. She said one story was ready to go! Yeah! And others need work. And that I'm thinking like a librarian and not a writer. Oh-no! Gotta correct that part. Today I had a Flower Fairy Festival at the library and then put the leftover fairy books where the Pirate books had been. Tomorrow, the 8-year old and I will go to the annual Greek Festival, put on by the local Greek church. 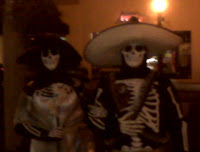 I go for the food and to watch the dancing. The 8-year old goes for the dancing and the games and crafts. Last year we both got Jingle scarfs to wear around our hips, so we'll probably wear them this year, over our skirts. 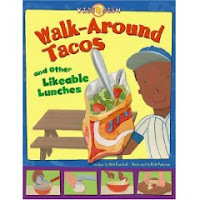 Walk-around Tacos and other likeable lunches by Nick Fauchald. Picture Window Books, 2008. Part of the KIDS DISH series. Available now. 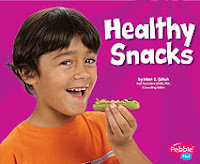 Can't think of anything for the kid's lunches? 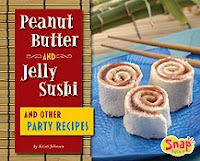 Here are some ideas -- and easy to make, too. hmmm. I'm afraid not too many are suitable for school lunchbags, but they make great so-it-yourself treats for weekends. Especially if your kids have friends over. They can make it a group project. Fun. An -- nice. The Glossary of cooking terms (and tips on how to do things easily) is in the front of the book. Handy. Then pictures of "kitchen tools." You say HERO and I say SUB and they're both the same thing -- so this book calls them: Super Hero Subs. Smart. 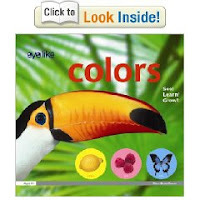 Other Nonfiction Monday book reviews can be found here. The strange thing I've discovered about Winnie the Pooh is age related. Yet, when I read them to first grade and up, they giggle and giggle. They "get" it. They funny loooooong titles. Living "under" the sign of Sanders? It's so satisfying to parent and child when the child thinks these references are as funny as the adult does. When I have more younger than older kids at a Pooh event at the library, I always tell "Pooh Goes Visiting and Gets Into a Tight Place." But do the very younger ones 'get' the sentence where Pooh requests, "would you read a Sustaining Book, such as would help and comfort a Wedged Bear in Great Tightness?" And, of course, there's nothing like an English Tea. (using apple juice and real glass punch cups) to finish off the program. I am so excited about my writing progress today. Because of my accident (and then losing three days to drug-induced sleep and not being allowed to use my arm for over a week) I abandoned one of the picture books I was working on for my September packet. It just wasn't going to get done. I took Wednesday afternoon off to organize, plan, and write. I played with a couple of stories. Then I pulled DARK out again. DARK had been discussed in the workshop part of my stay at Vermont College in July. Everyone agreed that it needed major changes. I was devastated. Only one person in the workshop "got it." And even she suggested changes. I had not done a good job presenting the story. During the past few months I tried several approaches to the story. Nothing worked. I must have been thinking about this story pretty hard back there in my "back brain," because suddenly last Wednesday I had an idea. I wanted to go back to my first way of presenting it -- first person with no indication as to whether the speaker was a boy or a girl. Because this is an "everyman" type of story. I loaded it onto my laptop and brought it to the 8-year old's gymnastic class. Got a good third of it re-written. Today is my usual day off. (We get Fridays off when we work Saturday at the library.) About 2:00 in the afternoon, I settled down with the laptop and plowed into the story, again. The basic revision is done. And it responds to most of the criticisms it got in the workshop. Now to figure out how to put the rest of my packet together -- it's due Monday. Did I get your attention with the word, Prize? No, the webkinz cat that I take to school visits and book signings does NOT count. This is a case where the illustrator goes off on her own and adds her mite to the book by including something NOT mentioned in the text. (at least it's not mentioned very often.) Good illustrators do this. Paige Billin-Frye is very good. 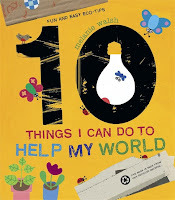 10 Things I Can do to Help My World by Melanie Walsh. 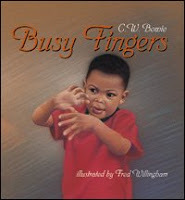 Candlewick, 2008. Available now. The subtitle is -- Fun and Easy Eco-Tips. Fun and easy they are. It's a flip-book! My favorite type of flip book -- half pages revealing more information when they are flipped. In fact, the flipping fun begins when you open the book. The lightbulb and its rays are cut-away on the right hand side. Turning it exposes the rest of the sentence on black paper and only the eyes of the bugs shining at you. A second sentence outlines the turned-off lightbulb. Wow! What a start. I can't wait to see what happens next. Well, what happens next is that every second page is like this. Because the background of the underlying page matches so closely to the page you are viewing, you don't realize that you've hit another cut-away until you try to turn the page and discover, again, that you are turning another 3/4 page, exposing the other half of the sentence. The publisher recommends it for age 3 and up. This is filed in the 363.7 area of the library, so you will have to hand-sell it to customers. Or maybe put it on display in April for Earth Day. -- the first Halloween question will appear. I fell last weekend in the library's staff room and landed on my left side. You should see the huge bruises on leg and arm. My left arm swelled up like a goose egg, so I went to Patient First, thinking that I had broken the arm. After X-rays of my shoulder, arm, and hip area, they determined that nothing had broken -- I just was badly bruised. Unfortunately, the medicine they gave me caused me to sleep the rest of the 3-day weekend. And made me too groggy to stay at work on Tuesday. I went home after only a half day's work. Wednesday, I saw a bone doctor. He agreed that the medicine they had given me was too strong. (It just goes to show that you aren't a drug addict. If you had been -- your body could have resisted that medicine better.) Since then, i've gone back to my usual Excedrin during the day and 8-hour Tylanol during the night and I feel much better. The arm is recovering nicely, thank you. I didn't even need the sling at all today at work. I'm getting back to my speedy touch-typing self. And the 5-inch in diameter bruise on my leg is a work of art. We spent the week at the library weeding the holiday books and correcting some mismarking on them. Now our holiday collection is nice and loose on the shelves -- all ready for the new holiday books to show up. The 8-year old had decided she loved, loved, loved her new third grade teacher -- just in time for the school to add a new teacher and move her and 20 other kids into a new classroom. The funny thing is -- this teacher has the same name as her 2nd grade teacher. So, on Monday she begins again with a new teacher. I do hope the original teachers share the school supplies we parents bought for the three classrooms with the new teacher and classroom. This Nonfiction Monday we have a guest blogger -- Kelly Milner Halls. She is the author of Albino Animals, Tales of the Cryptids, Mysteries of the Mummy Kids and 20 other nonfiction books. Sadly, even our fellow writers look down on our work. I love the ReaderGirlz campaign, and it got a lot of attention/press -- mostly Washington State authors. But when they approached me to write about them as a freelancer, I asked why they hadn't included any nonfiction writers. Frosty response...not what we're about. It was as if the concept of girls loving nonfiction was impossible to grasp. It was not even considered, which I think is a shame. No wonder girls don't step into the high paying realm of careers in math and science. The "cool kids" won't even let girls that love facts into the reader fold. Girls who love nonfiction are discounted as geeks. I don't have the answers, beyond just trying to write more compelling nonfiction myself. But I hope, someday we'll escape this stepchild status. Guess we'll have to wait and see, or take the bull by the horns and do it ourselves. It has crossed my mind. 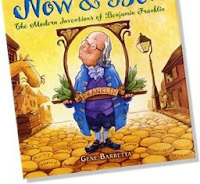 For more Nonfiction Monday, check out the list here.